An occlusive dressing is used in the treatment of moderate to severe eczema. The definition of occlusion is 'a dressing that seals a wound from air and bacteria'. Wet wraps are a way that bandages are used to treat eczema. Paste bandages are made of cotton. They are usually used on legs and arms. They are medicated, by being soaked in a medicated paste. There are a number of different pastes that are used. 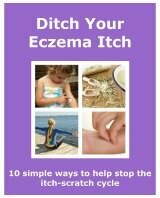 They have different properties and benefits to help treat eczema. The type you would use depends on how your eczema looks and its symptoms. Your doctor will advise the best type to use. They are available on prescription, but some can be brought over the counter. If you buy them yourself you need to be shown how to apply them before you use them. They need to be put on properly, and not too tight. An emollient or topical corticosteroid are applied to the skin before the bandage. It can get very messy! An emollient can be used liberally. If a topical corticosteroid is used it should be under the direction of your doctor. Paste bandages are usually applied by using a pleating technique. Just winding the bandage around the arm or leg is not advised. This can cause the bandage to tighten when it dries. You may not be able to move your arm or leg! The pleating technique is done by wrapping part of the bandage round and then making a pleat. This is done by folding it back on itself, then wrapping it in the opposite direction. Then applying a pleat on each turn at the side of the arm or leg. When moving the bandage upwards, overlap with half of the width of it. You start wrapping at the ankle when doing your leg. And start at the wrist when doing your arm. Paste bandages are left on for a day or two and cannot be reused. When a paste bandage is applied, a tubular bandage is put on the top. It stops the paste soaking onto your clothes or bedclothes. A tubular bandage is made of a woven material. They come in different sizes, and also in adult and children sizes. They are also made for different parts of the body. They can be washed and reused. The main brands are Tubifast and Comfifast. They are easy to apply, but can be a little more expensive. You can buy them over the counter or get them on prescription. Wet wraps are another form of an occlusive dressing. They are used mainly on children. They are used to treat moderate to severe eczema. The process involves using a skin treatment under 2 layers of bandages. A thick layer of emollient is applied to the skin. A topical corticosteroid can also be used but this can only be done under medical supervision. Over the top of the treatment a layer of wet bandage is applied. It will have been soaked in warm water. As they dry, they can be made wet again. You could use a spray bottle, like one used to water plants. The second layer is a dry bandage. It is wrapped over the layer of the wet bandage. These dressings can be got on prescription or brought over the counter. They can be washed and reused a few times. The wet layer will have some of the emollient or topical corticosteroid treatment on it. It is a good idea to soak them in detergent before putting them in the washing machine. Always make sure they are rinsed out properly. It prevents any detergent irritating the skin. Wet wrapping is used in hospitals, but can also be used at home. It can be a messy job. It can also appear to be complicated. You need to be shown by a doctor or specialist how to apply them. They tend to be used on younger children. Applying them can be time consuming and difficult to put on. You need to think about when would be a good time of the day to put them on. Tired children can be irritable and fidgety. So trying just before they go to bed might not be the best time. It is also good if your child doesn’t see it as a chore, or something to get stressed about. They can join in with it. The process can be made into a positive one. Keeping your little one occupied helps. You could watch a DVD. It helps keep their mind off it. It can also make it seem that it doesn’t take too long. Wet wrapping should not be used on infected eczema. The wetness and warmness that the bandages cause promote bacteria growth. It could cause the skin to get worse. So choose a different type of occlusive dressing to use. Using a bandage as a occlusive dressing may not be the ideal choice for babies or toddlers. There is clothing that is available for little ones to wear. It does the same job as the bandages, but may be easier to put on.